Achilles pain is a common injury associated with sports. Sometimes your Achilles pain may come and go after performing a higher intensity or longer work-out than what you normally do. But when you start to develop Achilles pain that won’t go away after a couple of days, you need to seek professional help. Now I know how stubborn athletes are. I am a runner and my #1 motto is “push through the pain,” when I’m running long distance. The mental fatigue overcomes the physical. And I’ve had my fair share of Achilles pain now that I’m getting older and trying to stay at the pace I ran in my 20s. But ignoring pain that does not resolve after stretching, icing and anti-inflammatories is a recipe for disaster! So you have pain in the back of your heel and you immediately go home and Google “Achilles pain with running.” Since I’ve done this myself I can vouch for all the BOLOGNEY that is available on the internet. Trust me, WebMD and Wikipedia do not know everything! They give you an idea of what symptoms are associated with Achilles pain, but I’ll tell you the honest answer…not one website is gonna give you the answers you seek! But a professional foot and ankle doctor will. So what are you waiting for…go see a podiatrist! At Advanced Podiatry, we specialize in sports medicine. We treat runners because we not only support what they do, but we’re runners ourselves! Achilles pain can be anything from a strain, tendinitis, tendinosis, or a tear in the tendon. The internet cannot help you differentiate between the different types of injuries because the internet cannot perform a biomechanical exam, palpate where your pain is, or tell you what to do to fix it. 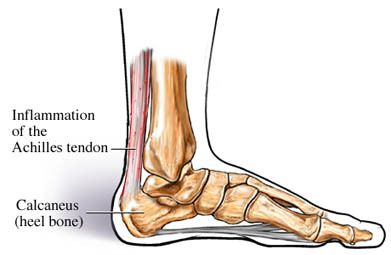 Achilles tendinitis which is inflammation of the Achilles tendon at areas along the back of the heel is not treated the same as Achilles tendinosis which is actual breakdown of the Achilles tendon fibers. If Achilles tendinitis or Achilles tendonosis is not resolved properly, these conditions can set you up for a partial tear or even rupture! So stop being so stubborn! And come see the doctors at Advanced Podiatry so they can perform a biomechanical exam, pinpoint where your pain is and tell you exactly what to do to treat it! Call Advanced Podiatry today at 813-875-0555 for an appointment to treat your Achilles pain today!